Been seeing lots of Long Champ bags lately in different colors and to tell you the truth, I’m also tempted to buy one eventhough it looks pricey to me. Anyway, if you’re used to seeing solid colored long champs or even those new limited edition florals or with patches, then take a look at this Limited Edition Transparent Long Champ Darshan Handbag. This is perfect everyday bag, for shopping, quick errands, a day on the beach or your travel. Nothing is more precious when you receive flowers. It can lighten up your day and bring smile to your face. Mother’s Day is coming in no time and giving your mom or any woman in your life flowers will make them more special. There are literally lots of beautiful flowers to choose from such as tulips, roses, sunflowers, stargazers and more and they can be ordered in vase, bunch or in baskets. When special occasions are coming it is always best to order much earlier to avoid rush and of course you there are still plenty of stocks. Some online stores are even taking advantage of the occasion and they are giving discounts. ProFlowers discounts on flowers are always the best, you can get discount on your orders using discount codes. Gisele Bundchen is Brazilian supermodel and became one of the Victoria's Secret Angels. Everyone seems to envy her body and I'm not sure if one point in her life she even needed lipozene to be in shape. Just in case you didn’t know, Gisele Bündchen is the one who popularized the "horse walk" and it became her signature walk. Just imagine a horse while it is walking hehe. Anyway, here are just some of the fashion style of Gisele Bundchen when she’s out of the runway. Anyway can actually imitate her look as there are some clothing line that are not that expensive. Gold jewelries will always be an eye candy for me. I remember entering a jewelry shop at the mall and my eyes just feasted over the wonderful collections that they have there. Wish I have the the budget right then and there because if I do have then I should have come home with a nice bracelet on my hand. I’ve been eyeing a necklace at Macy’s for a while now but since it has a hefty price tag even though it was on a special offer, still I could not afford it. This 14k Gold Small Graduated Cleo Necklace is tagged at $1,800.00 at MACYS.com. You can check out the site for more specials on gold jewelries. Check out The Rue Sandal : Coach Summer Sandal Collection 2011 which is available at COACH.com for $138.00. It comes with 4 different colors such as Leather Black, Fushia, Grey and Chestnut, perfect this summer. Aside from wanting real gold bars, I'm also drooling over these Ippolita Gold Jewelry Collection over at Neiman Marcus. These gold collection are definitely work of art as you can see with the intricate designs and craftsmanship. This cascading diamond-shaped earrings are eye-catching as it is made of 18-karat yellow gold and white calcite. Brace yourself as the price is $2,495.00 but if you have the money and you love great piece of jewelry, then this collections are worth the price. I Shopped Till I dropped! 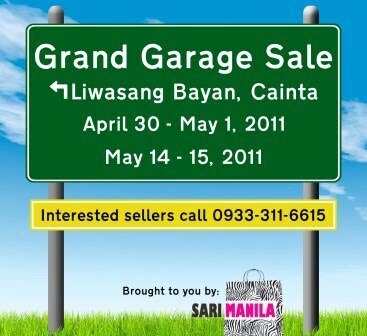 SM department stores had a 3-day sale once again (April 1, 2 and 3, 2011) and oh boy I can't resist the discounts. My family and I went to the nearest SM branch yesterday and we bought a 32" Samsung LCD TV that we've been dreaming to have since Christmas last year. It was on sale so we're happy to get it. After buying the TV, they proceeded to the home depot section to buy some abrasives and knob for the house and later on they had their snacks while I went shopping on my own as I don't want anyone to tag along with me. For sure they'll get dizzy when I shop as I go around, go inside from one shop to another. Also, I don't want them to see what I'll be buying hehehe. I bought shoes, blouse, jeggings, clock for my room and other household items. Yay, it's really fun to shop. 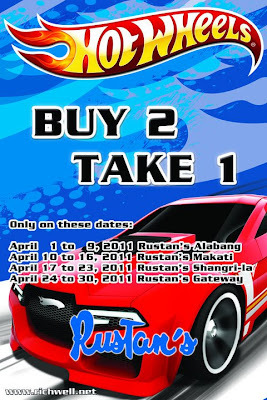 I can't wait for another 3-day sale. 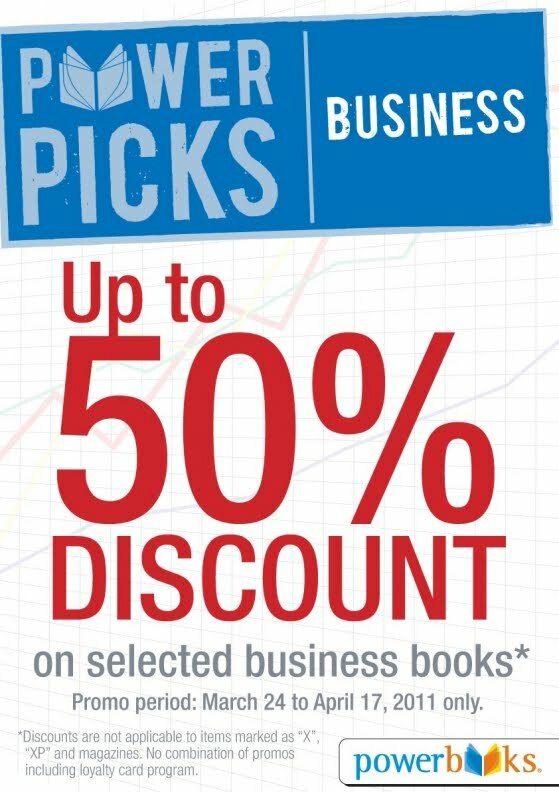 Business Books on SALE in Powerbooks! 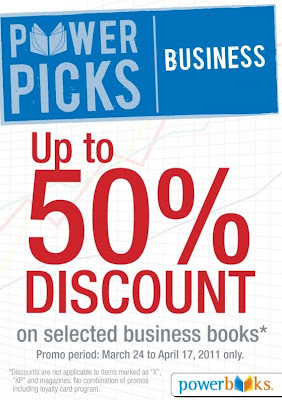 Hey there book lovers, you can enjoy up to 50% discount on bestselling business books from world-famous business gurus such as: David Bach (Smart Couples Finish Rich),Richard Bolles (What Color Is Your Parachute series) Brian Tracy (Crunch Point), Lois Frankel (Nice Girl Don't Get Rich series ) and William J. Rothwell (Improving on-the-job Training). 5. There will be no combination of promos, including Loyalty Card program.